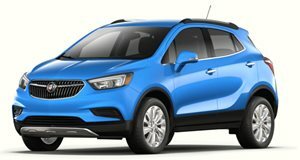 New Buick Encore and Encore GX to bow in two weeks' time. It's been more than seven years now since Buick rolled out the Encore, and that's an eternity in a market as competitive as the compat crossover segment. We've been expecting, then, for GM to roll out a replacement – especially since it sold off the European division that launched it as the Opel Mokka. And that appears to be just what it has in store for the next major auto show. Not the one in New York, but the one in Shanghai – the heart of a market even more important to Buick than North America. In releasing this solitary teaser image, the manufacturer announced that it will reveal the new Encore – in two forms, no less – during the Buick Brand Night on the eve of the Shanghai Auto Show. The two versions are dubbed the Encore and Encore GX – the former described as a "small SUV” and the latter as a "compact.” The main difference could come down to a shorter or longer wheelbase, but the teaser image suggests there'll be at least some stylistic differences as well. The taillights, for example, take different shapes, as do other details we can discern. Each cuts a different profile, the blue example on the left with more sculpted haunches and the red one on the right with ostensibly "cleaner” lines. The statement indicates that two transmission options will be offered, including a nine-speed automatic and a continuously variable transmission. They'll also benefit from "updated design and enhanced connectivity” as well as "outstanding styling, optimized interior packaging, improved efficiency and new technologies.” We'll have to wait for more until they're unveiled on April 15, and possibly longer until we found out which version, if any, might make the transition to US showrooms. It’s due for a facelift soon, but is the Buick Encore in its current state still worth buying?